Semantic Artificial Intelligence (Semantic AI) is an approach that comes with technical and organizational advantages. It’s more than ‘yet another machine learning algorithm’. It’s rather an AI strategy based on technical and organizational measures, which get implemented along the whole data lifecycle. Semantic AI combines thoroughly selected methods and tools that solve the most common use cases such as classification and recommendation in a highly precise manner. Current experience shows that AI initiatives often fail due to the lack of appropriate data or low data quality. A semantic knowledge graph is used at the heart of a semantic enhanced AI architecture, which provides means for a more automated data quality management. In sharp contrast to AI technologies that ‘work like magic’ where only a few experts really understand the underlying techniques, Semantic AI seeks to provide an infrastructure to overcome information asymmetries between the developers of AI systems and other stakeholders, including consumers and policymakers. Semantic AI ultimately leads to AI governance that works on three layers: technically, ethically, and on the legal layer. Most machine learning algorithms work well either with text or with structured data, but those two types of data are rarely combined to serve as a whole. Semantic data models can bridge this gap. Links and relations between business and data objects of all formats such as XML, relational data, CSV, and also unstructured text can be made available for further analysis. This allows us to link data even across heterogeneous data sources to provide data objects as training data sets which are composed of information from structured data and text at the same time. 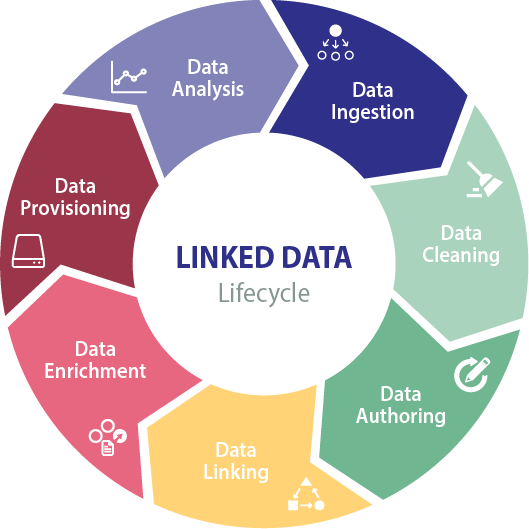 Linked data based on W3C Standards can serve as an enterprise-wide data platform and helps to provide training data for machine learning in a more cost-efficient way. Instead of generating data sets per application or use case, high-quality data can be extracted from a knowledge graph or a semantic data lake. Through this standards-based approach, also internal data and external data can be automatically linked and can be used as a rich data set for any machine learning task. Semantic AI is the combination of methods derived from symbolic AI and statistical AI. Virtuously playing the AI piano means that for a given use case various stakeholders, not only data scientists, but also process owners or subject matter experts, choose from available methods and tools, and collaboratively develop workflows that are most likely a good fit to tackle the underlying problem. For example, one can combine entity extraction based on machine learning with text mining methods based on semantic knowledge graphs and related reasoning capabilities to achieve the optimal results. Semantic AI is the next-generation Artificial Intelligence. Machine learning can help to extend knowledge graphs (e.g., through ‘corpus-based ontology learning’ or through graph mapping based on ‘spreading activation’), and in return, knowledge graphs can help to improve ML algorithms (e.g., through ‘distant supervision’). This integrated approach ultimately leads to systems that work like self optimizing machines after an initial setup phase, while being transparent to the underlying knowledge models. Data is the fuel of the digital economy and the underlying asset of every AI application. Semantic AI addresses the need for interpretable and meaningful data, and it provides technologies to create this kind of data from the very beginning of a data lifecycle. Companies possess and constantly generate data, which is distributed across various database systems. When it comes to the implementation of new use cases, usually very specific data is needed. Questions arise, if this data is available and if so, where. In many cases, valuable data could even be inferred automatically, if various data sources would get linked. Applications usually evolve and will require additional data from somewhere else. Generating data for a specific application doesn’t mean that data workflows in the source system will be replaced. This can lead to data duplication an error-proneness in an organization. Those few examples already spell out the complexity of agile data management. It is by no means a technical responsibility only but illustrates the importance of a central data governance framework for digitizing an enterprise including its products and services. The introduction of Artificial Intelligence is becoming a game changer for organizations and society. Though enterprises are willing to invest in AI is not easy to define a clear path on how to start. We believe that integrating Semantic AI into the organizational strategy is foremost the first step for AI governance. This is because semantic web technologies can provide the foundation for an enterprise-wide rollout of AI. Therefore, we offer the five key considerations to help you deliver on the Semantic AI promise. Define your actual business needs and be aware of the maturity level of AI technologies. Based on your execution capabilities embrace Semantic AI as an organizational strategy. Semantic AI offers you a future-proof framework to support AI with data integration, your first strategic step. To trust the results of AI applications where only a few experts understand the underlying techniques is a challenge that the AI community has not been able to solve. Semantic AI allows several stakeholders to develop and maintain AI applications. This way, you will mitigate dependency on experts and technologies and gain an understanding of how things work. From data capture to data usage, Semantic AI helps you generate, maintain and increase data quality at any step of the data lifecycle. You will profit from data-driven initiatives that are easy to implement. Subject matter experts without any specific knowledge about the underlying datasets could provide guidance on where to start. Data is the underlying asset of every AI application. Semantic AI establishes a professional information management and data governance infrastructure to help you link and enrich your content assets semantically to obtain clean data to support your AI efforts. Increase the quality of your data with inputs from your organization’s most important assets, your employees. Semantic AI enables subject matter experts without mathematical or software engineering skills to understand the logic behind data processing and to contribute with their domain-specific knowledge. We are also recognized as one of the 100 companies that matter in Knowledge Management.